If you've visited any number of popular Internet news outlets including BuzzFeed, Thrillist, or The Huffington Post then you have seen a listicle about some topic or another. A listicle, for those not in the know, is combination of article and list, in which a media outlet curates a topic and presents its top picks (or pans). The benefits of listicles include buzz for your brand, clicks for your website and qualified leads for your business. The beauty of listicles is that you can create your own for use on your blog, a guest post on another blog or a sponsored listicle in an established media outlet (for a fee). Step 1: Pick a subject. Figure out what key details you want to share with readers. Say you want to create a list of Vermont bed and breakfast locations with the best view of fall foliage. You will need to decide what factors will drive your rankings, and why some made it into the list while others did not. For instance, I recently wrote a listicle for Culturemap about the top 10 coffee shops for professionals in Austin. I addressed such items as WiFi network, parking, popular drinks, power outlet availability, etc. In the end, I gave each of the coffee shops on the list a score out of five coffee cups. Step 3: Choose a layout. How will you present your listicle? Will it be in paragraph form, with a smartly written description of each contender? How about as a bullet list with terse explanations or numeric ratings of specific features? Or perhaps you will go with a blended approach to freely describe something without sacrificing directness. No matter what you decide, you should prepare a summary layout of the finished listicle to use as a template for later. Step 4: Make it short, sweet and error free. A necessary ingredient to successful listicles is brevity. Avoid rambling descriptions or stuffing the piece with too many details. You might consider letting colleagues and friends read the listicle, and incorporate their feedback. Plus, let the piece sit for a couple of days and then go back over it with your editorial glasses to pick out any weak sentences or bad grammar. Step 5: Choose great images. To make a listicle pop, you should use high quality images. The listicle idea above on golf packages for seniors in Florida should have pictures of manicured putting greens, breathtaking bunker shots and plenty of seniors enjoying a round of links. You can also use Vines or GIFs to capture an animated version of your subjects for topics such as the best Mardi Gras parades or best bird watching locales. Step 6: Include a byline and bio. You are providing a media outlet with fresh, free content, so the least it can do is provide you with a short byline (author description mentioning your name and business) with a chance to get a linkback to your website. This is the golden nugget you are mining with a listicle, a chance for increased buzz for your name, your brand and business website. 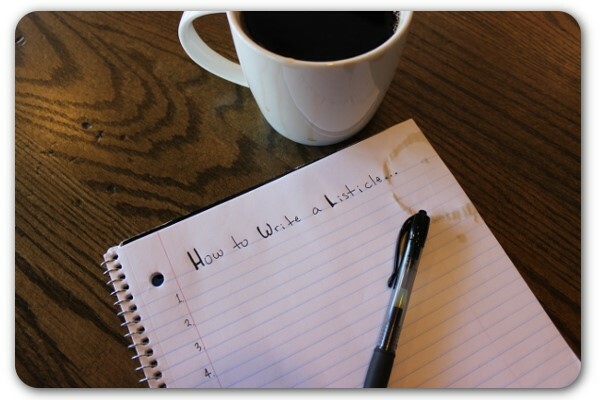 After you write your listicle you want to see it published, right? Finding the most relevant media outlet will make that job a lot easier. Continuing our example about the Florida beach resort catering to seniors, the author would be wise to approach websites focused on Florida tourism and senior lifestyles. Hyper-local media outlets like to publish listicles about all kinds of topics, from where to go for Mother's Day brunch to the best summer camps for kids. If you can't find an established media outlet to publish your listicle, approach industry blogs that may have smaller audiences, but will still provide you with a strong link to your website. Promote the heck out of every listicle you publish. Use your own social media assets to spread the word several times over the week the piece is published, then spread mentions out over the next few weeks and months to keep it circulating. Ask friends and collaborators to share, too, to maximize the reach on social networks. Consider pre-composing tweets to make it easier for friendly mentions. Thank anyone who shares your listicle to show your gratitude (and prime your friends for future shares). Don't take rejection the wrong way. It often takes many tries before you strike gold with a publication, especially in a national media outlet. Keep trying, learn from feedback, make connections with media professionals, and eventually you will be rewarded.